Michaela Blockcolsky's camera recorded our Sept. 10, 2016 concert on a hay wagon in front of Morganville School, with Elizabeth Anne Mall signing pops songs and premiering one of her original songs "Masterpiece" from her new album Belle Laide. CD's of her album were signed and autographed, and there are still some available for a donation of $7.00. What is unique about the Community Chamber Orchestra? 1. It is an LLC employing youth through adults to perform live chamber orchestra music in North Central Kansas. 2. The musicians perform without a conductor. 3. As of December 2012 the Community Chamber Orchestra is a sponsored project of Fractured Atlas, a non-profit arts service organization. Fractured Atlas will receive grants for the purposes of Community Chamber Orchestra, provide oversight to ensure that grant funds are used in accordance with grant agreements, and provide reports as required by the grantor. Contributions for the purposes of Community Chamber Orchestra must be made payable to Fractured Atlas and are tax-deductible to the extent permitted by law. 4. Contributions by individuals, organizations, and businesses have built the Orchestra. These contributions can be given as tax-free through the Clay Center Arts Council, or as advertising for businesses. For more information on being a sponsor of the Community Chamber Orchestra, contact Dr. Anne Clark at 454 23rd Rd., Morganville, KS 67468-9117, (785) 926-4725, or bclark@diodecom.net. 5. The Orchestra offers a unique chamber orchestra experience. It draws from rural, small town, and large city populations of North Central Kansas. Many of its members live on farms. It also allows families to share live music making: several sets of parents and their children are currently playing, as well as siblings. It is intergenerational, in that senior citizens, young adults, and youth all play together. 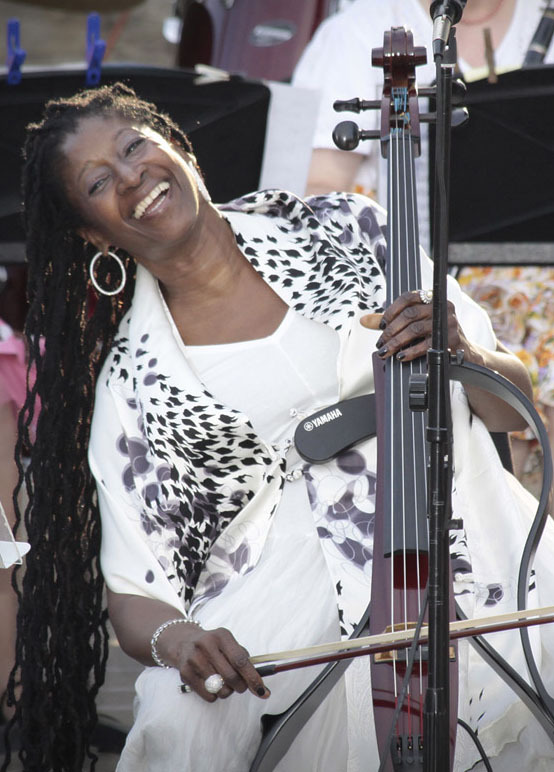 Grammy-award winning cellist and composer Akua Dixon shared her jazz compositions in a concert May 27, 2011 on Morganville's historic outdoor stage. 6. The Orchestra features soloists who are both professional musicians and high school students. This brings high quality performances to an underserved area of North Central Kansas, and gives aspiring musicians opportunities for concert experience as soloists. 7. The Orchestra has completed a unique 2-year project, "Agriculture and the Arts," which celebrates our Kansas agriculture through music and photography. See our sidebar for presentations of 35 framed original photographs which are in the permanent community exhibit created through this unusual project, as well as the AgriTalk Radio interview about its history. 8. 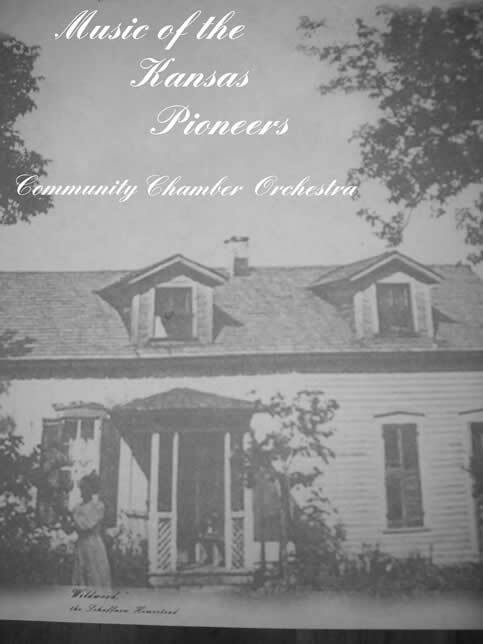 The Orchestra has just completed production of a copyrighted historical 2-CD set, "Music of the Kansas Pioneers," containing pioneer music of the 1800's and early 1900's which was recorded live in its 2001 "Pioneers of Bloom Township in the 1880's" concert and in its 2006 "Letters From Morganville" concert. 50 of these CD sets have been distributed free of charge to North Central public and school libraries. 50 more are available for purchase by individuals, organizations, and other libraries. For more information and the lyrics, see the CD section on the left.